How Do ESD Safe Smocks and Lab Coats Work? Home / Static Shielding / Clothing / How Do ESD Smocks Work? How Do ESD Smocks Work? Answer: ESD Safe Smocks present a conductive, static shielding barrier between electrostatic discharges (ESD) emanating from your body and any electronics that you may be near. Made with static dissipative fabric these garments also resist becoming charged with static electricity. First, let’s look at the “static shielding” properties. Anything that is a conductor potentially serves a “static shielding” function. Conductors shield static because they attract electrons. Once the electron is on the conductor, it can be grounded by the conductor. Grounding is what prevents static from accumulating on surfaces and ESD (electrostatic discharges of electrons). 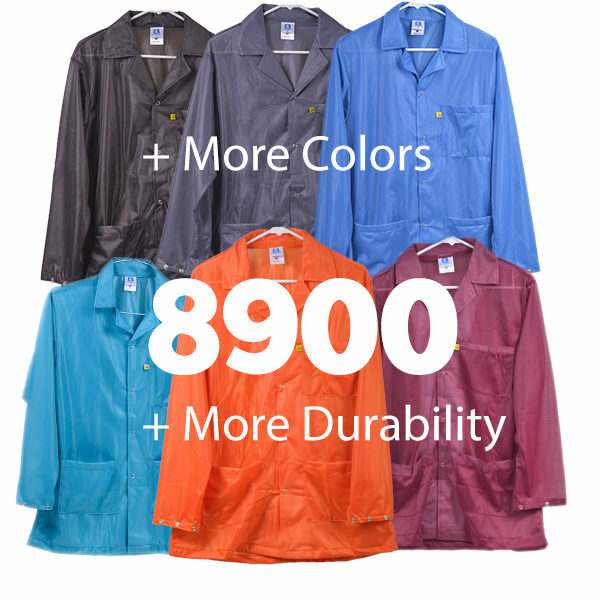 Premium Cotton Polyester 5049 Series ESD Smocks seen at the macro scale. Conductors commonly used for grounding electrons are aluminum and carbon. In ESD Jackets, carbon threading is sewn into a grid across the surface of cotton or polyester in a patchwork. Much like a fence protects a yard, the grid pattern of the black carbon threading prevents static electrons on your body from leaping through the smock as electrostatic discharges (ESD) and zapping nearby electronics. The standard for the quality of ESD Jackets is set by the ESD Association. These are endorsed by the American Nation Standards Institute (ANSI). Hence, the standard is referred to as ANSI / ESD S20.20. The current version is 2014. (ANSI / ESD S20.20 2014). ANSI / ESD S20.20 2014 provides three definitions for ESD Garments. To meet the ANSI / ESD S20.20 standard an ESD smock has to meet 1 of 3 definitions (which are defined using ranges of “surface resistivity”). This is outlined in the ESD Association’s Standard Test Method (STM) 2.1. Per ANSI / ESD S20.20, an ESD Garment is defined as either a Static Control Garment (surface resistivity of < 1 x 1011 ohms resistance); a Groundable Static Control Garment (surface resistivity of < 1 x 109 ohms resistance); or a Groundable Static Control Garment System (surface resistivity of < 3.5 x 107 ohms resistance).